The son of Philip and Annie Palmer, William Palmer was born in Balderton, Newark in 1892. William was the eldest boy in a farming family of seven children (four elder sisters, Ada, Alice, Florrie and Lily and two younger brothers, Leonard and Albert. By 1906 William was attending school in Bottesford. 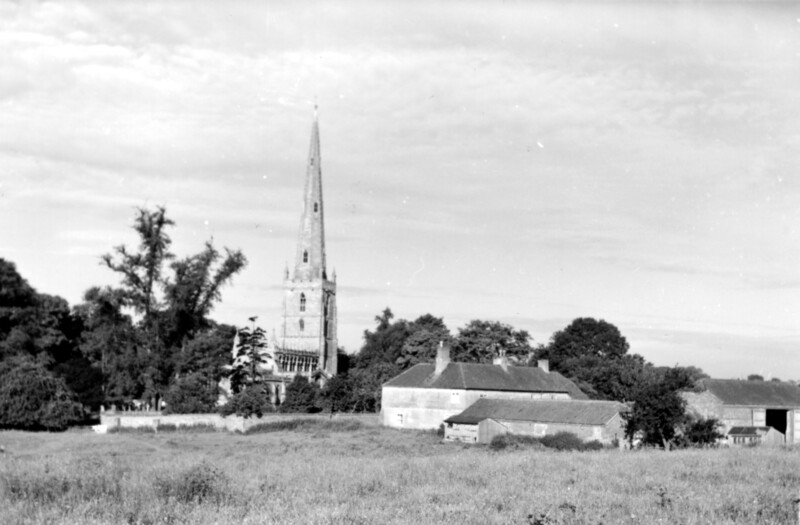 The family had moved from Long Bennington to Church Farm, Bottesford. The Bottesford School Log Book records that in 1906 William was awarded a County Junior Scholarship (Class C) and that he intended to hold the position as a pupil teacher at Sedgebrook School. He did not pursue a teaching career iand he took up work on the family farm. The 1st World War would thwart any ambition for him to lead the farm on into the next generation. That would fall to Len, his younger brother. Len Palmer would be the last of his family to work Church Farm before its sale in the 1980s. The house still stands but is now a private home. 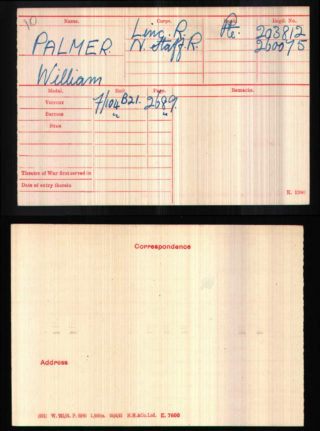 No records survive giving full details of William Palmer’s service in the 1st World War. However, his Medal Index Card indicates that he served with both the Lincolnshire Regiment as a Private (203812) and with the North Staffordshire Regiment (service number 260075). He was not lisrted for the 14-15 Star and therefore would not have seen active service prior to the 31st December 1915. The battalion he served with in the Lincolnshire Regiment is not recorded. 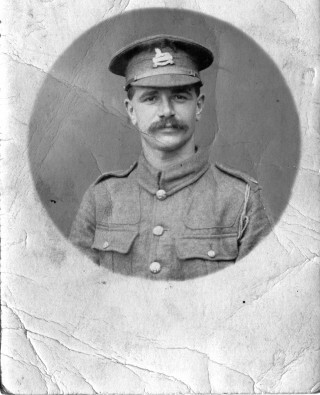 The photograph of him wearing a Lincolnshire Regiment cap badge gives details on the reverse of service with the 15th Platoon 2/6th Battalion North Staffordshire Regiment. However his service number with the Lincolnshire Regiment (203812) is in the region of numbers allocated to recruits to either the 2/4th or 2/5th Battalion. The 2/5th was formed in Grimsby in February 1915 whereas the 2/4th was formed in Lincoln. Both were were sent to to Ireland with the 59th 2nd North Midland Division in April 1916 where they sustained casualties in fierce fighting during the rebellion against British rule. After withdrawal from Ireland both Battalions underwent further training before transfer to France in February 1917 and subsequent front line action. If William had sustained injuries during those periods of active service on recovery he would not necessarily have been posted back to his Battalion in the Lincolnshire Regiment. That could explain a transfer to the 2/6th Battalion North Staffs Regiment. 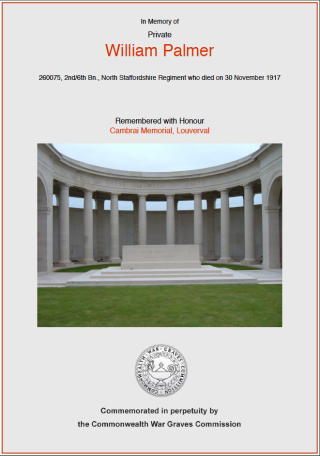 However, there is also evidence that soldiers from the Lincolnshire Regiment were directly transferred from Infantry Base Depot (9) in August 1917 directly into the 2/6th North Staffordshire Battalion (see the records of Private Arthur C Markham 40878). This could also have been the case for William Palmer. Given that it is not possible to determine the exact date on which William Palmer transferred we can only surmise the nature of his service with the 2/6th Battalion North Staffordshires. If he had joined the Battalion before their arrival in France in late February 1917 he could have experienced 8 months of active service and further training before his loss in the Battle of Cambrai on the 30th November 1917. His Battalion was part of the 59th (2nd North Midland) Division. This division was engaged in pursuing the Germans in their April 1917 strategic withdrawal east from the Somme. May and June was a period of training in advance of the Division’s engagement in the 3rd Battle of Ypres during September 1917. After suffering considerable losses in that that Battle the Division then relieved the 1st Canadian Division in October in the Lens Sector. They were also given notice that they would be used to capitalise on the expected success of the forthcoming Battle of Cambrai. In mid November they were moved to Bapaume in advance of any engagement at Cambrai. ‘Sir Douglas Haig described the object of the Cambrai operations as the gaining of a ‘local success by a sudden attack at a point where the enemy did not expect it’ and to some extent they succeeded. The proposed method of assault was new, with no preliminary artillery bombardment. Instead, tanks would be used to break through the German wire, with the infantry following under the cover of smoke barrages. The Battalion relieved the 2nd Battalion The Coldstream Guards in support trenches in the S.W. of Bourlon Wood. Capt. R.M. Sheppard Cmdg C Coy was wounded. Enemy heavily bombarded Bourlon Wood with H.E. (High Explosives) and Gas shells and attacked front line position on the 2/6th North Staffs Regt. front in which we were in support: A Coy of this Battalion advanced through the wood under heavy fire and reinforced the front line in answer to the SOS signal: Capt. H. Yeatman CMDG A Coy was wounded and gassed and the Coy sustained several gas casualties. The Battalion was heavily bombarded by gas and H.E. Shells and Capt B. S. Atkinson CMDG D (Coy) was killed: During those two days the Battalion suffered heavy casualties. The Battalion was relieved the following day on the 1st December. The total losses for the two days of action were: Officers 1 killed; 3 wounded; 14 gassed. Other Ranks 13 killed; Wounded and gassed 392 of which 64 subsequently died and 15 missing. The Battalion received 455 Officers and men on the 31st December to bring it back up to strength. William Palmer was one of those reported missing for the 30th November. Unlike all the other men lost from Bottesford and Muston no details of William Palmer’s death were ever reported in the Grantham Journal. His mother held on to her belief that he might return. He is remembered on the Bottesford War Memorial and on the Cambrai Memorial in the Louverval Military Cemetery. The CAMBRAI MEMORIAL commemorates more than 7,000 servicemen of the United Kingdom and South Africa who died in the Battle of Cambrai in November and December 1917 and whose graves are not known. Bourlon Wood was retaken by German forces in their March 1918 Spring Offensive and then finally taken by Canadian Forces in September 1918. That final engagment would cost the life of another Bottesford soldier, Frank Raithby who died of wounds on the 6th October 1918. Frank Raithby was awarded the Distinguished Conduct Medal for his bravery in supporting his Commanding Officer George Fraser Kerr in the recapture of Bourlon Wood. George Frazer Kerr survived and received a Victoria Cross.